Pinot Grigio. One of the most well-known Italian grapes, it just might be the least respected among connoisseurs. This typically cheap white is, of course, inarguably one of the best-selling in the US, but rarely receives oenophile attention. “It doesn’t really taste like anything,” says the wine specialist at my local store when I bring it up. 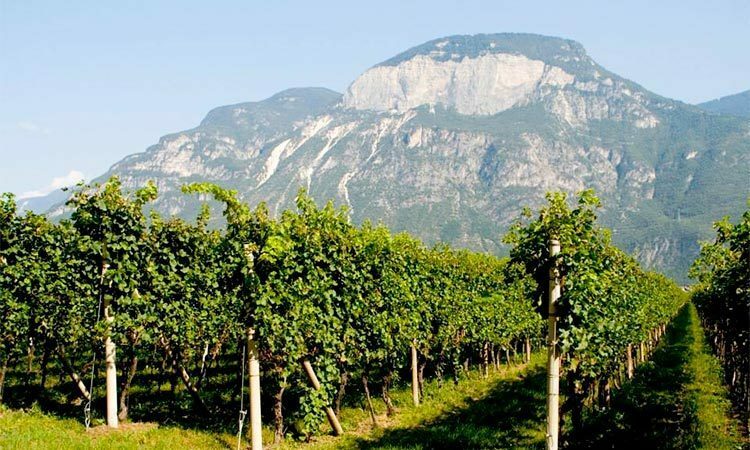 This opinion is not a solitary one; it stems from the tide of bulk wine that flows out of the “delle Venezie” IGT (mostly Veneto and Trentino), made by wineries like Cavit, Bolla, and Mezzacorona. Pale and insipid, this juice can offer some freshness but not much else. On the Esquire show Uncorked – which follows several Master Somm candidates as they prepare for their exam – one guy is shown rinsing with Grigio in place of brushing his teeth the morning of a blind tasting, so as not to throw off his palate. Interestingly, Pinot Gris – the same grape, with French styling – receives none of the disrespect of its Italian twin. It’s quite highly regarded, in both Alsace and in Oregon. People rarely call it boring or plain; it can feature in some of the most exciting whites from those regions. Despite carrying a healthy dose of skepticism for years, I recently find myself wondering if Grigio can ever match up to Gris. Is Italy’s version a lost cause, or can it actually be good? My awakening begins with a bottle from Castelfeder in the Alto Adige that’s full-bodied and luscious, turning any and all previous notions of the Grige on their head. Of course, most of my experience up to this point has been of the Santa Margherita mold: well-known but not particularly good. I start to seek wines made in the ramato-style – a copper-hued wine that’s been fermented briefly on its skins, imparting some of the color, flavor and tannin. Produced primarily in the Friuli-Venezia Giulia sub-region of Collio, they’re not only surprising in appearance but offer a completely different gustatory experience when compared to the stuff we all know and, er, don’t love. Di Lenardo, who produces the ramato Gossip, says he enjoys vinifying a wine in this “special” way that the industrial cellars won’t, as well as helping to educate consumers that the Pinot Grigio grape is actually quite dark in color (Grigio means gray). He also notes how this method can produce “bigger texture” as well as “distinctive aromatic power.” And while Gossip does feature varietally typical flavors of stone fruit and tart apple, there is absolutely more. Feral notes of hay and fuzzy peach showcase in the aroma, and a distinct bitter almond note coincides with the finish. Though softer than I’ve come to expect with Grigio, a nibble of tannin adds balance. One of the finest ramato bottles I come across takes me out of Italy, across the border to Slovenia, specifically the region of Štajerska, which – although towards the eastern side of the country — is still as close to Collio as Verona. The winery Pullus (aka Ptujska Klet) has been around for a little bit, according to the label, which claims, no joke, “since 1239.” Regardless, they produce a killer ramato, lighter than Gossip but also sharper, redolent of strawberries and raspberries followed by a mineral and herb-tinged finish. With no disrespect meant to the surely wonderful folks of Štajerska, this is one fine Italian Pinot Grigio. Though distinct, the ramato-style in and of itself neither equates to bigger or more serious. Take the wines of Fruili’s Attems. While their ramato offers up rose-like fruit alongside a touch of tannic dryness, the overall impression is gentle and elegant. Attems’ non-ramato Pinot Grigio – which is darker than plonk yet still a white wine – on the other hand, is rich and lush, showcasing deep fruitiness (tangerines!) alongside nutty complexity and mouthwatering salinity. Wow. Heading back up to the Alto Adige, Peter Zemmer Pinot Grigio is yet another standout. Perhaps the palest of the mentioned wines, it defies that with bold flavor. Huge herbal aromas act as an Alto Adige calling card, but opulent peach, pear and melon bring balance. Experiencing this abundant fruit’s coexistence with vibrant freshness, it’s hard to imagine this grape ever developing its reputation for blandness. It also, of course, requires higher costs. “Low yields are the main reason for the high quality,” Unterholzer continues “which clearly has to have a certain price, since we invest on average 500 hours of manual work per hectare to get the best out of the vineyards.” Don’t fret, though. It’s still only about $20/bottle. Tough to compare on paper with Cavit at $8, perhaps… until the wines are tasted. This story is, in the end, hardly surprising. Should we, for example, estimate the potential of California Cabernet by bottles of Woodbridge and Barefoot? Hardly. Nor should we judge Pinot Grigio based on bulk garbage. Me, I began this quest intrigued yet skeptical about the potential of Pinot Grigio. Now here I sit, an unabashed fan. Are you finally ready to open your own mind? Top image via Castelfeder Facebook page. Glad you joined our group this month! Interesting that pinot grigio is suggested to use for rinsing out a glass. I would think that would affect the next wine over water. Thanks Jennifer. I think the rinse suggestion was somewhat tongue-in-cheek, although rinsing with water is definitely frowned upon, as the chlorine can affect taste and residual water can also change how the wine clings to the glass (if you’re looking for visual cues). In reality your best bet is to either not rinse at all (especially in a progressive tasting) or rinse with the incoming wine. When I was taught to blind taste, I was told that if I came across an insipid white it was best to guess Pinot Grigio! But I think skin contact transforms this grape. Nice to see someone singing its praises for a change! Haha, very true Natasha. Thanks for reading!